The Halter ED-310 Elevating Desktop was designed to assist those who are challenged with back, neck, posture, and circulation problems. 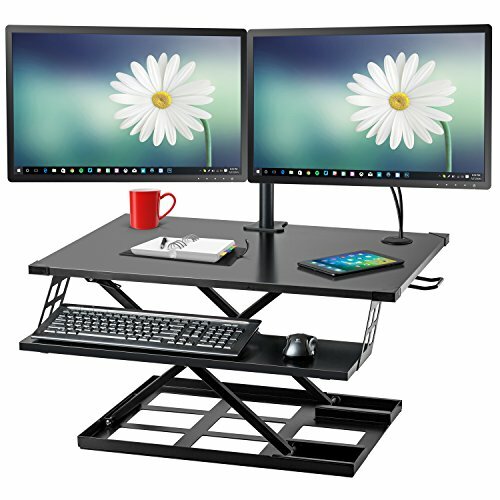 It provides multiple height desktop work levels to maximize comfort, introduce work height variations, optimize posture / natural blood circulation, and reduce eye strain. Studies have shown that our bodies can benefit from simply standing up, contracting muscles, and moving. Think of standing as pushing a reset button on your body. If you press the reset button before the timer hits 20 minutes, you'll avoid any of the negative side effects of a sedentary job. - Just place the desk on top of a table / desk / etc. and you're all set! - Switches from sitting to standing position in seconds. Just squeeze the handle on the right side of the desktop. Apply pressure up or down to raise or lower the desktop. Once you find your desired height, just release the handle and your desktop will lock into position. - With high quality construction, movements up and down are extremely smooth! - Enjoy the freedom of sitting or standing while you work! - Sturdy even when at standing height! - Included Optional Keyboard/Mouse Tray. Install it at your wish if you'd like a nice big space to place your keyboard and mouse!